Survey: Protecting Oceans Is Low Priority For Leaders In Developing Countries : Goats and Soda Leaders in developing countries were asked to rank the U.N.'s 17 Sustainable Development Goals. One particular goal was typically at the bottom of their priority list. A Somali fisherman carries a fish to the market near the port in Mogadishu. One of the U.N. Sustainable Development Goals calls for the world to "conserve and sustainably use the oceans, seas and marine resources for sustainable development." Of the U.N.'s 17 goals to make the world a better place by 2030, one goal gets much less respect than the others. It's not improving education. It's not wiping out poverty and hunger. It's Goal #14 — which aims to "conserve and sustainably use the oceans, seas and marine resources for sustainable development." Several of the goals deal explicitly with environmental issues, and the new survey, conducted by the AidData research center at the College of William and Mary, is the latest indication that these may be getting short shrift — despite oceans of evidence that protecting the environment leads to big development gains in the forms of jobs and food. The survey respondents were asked to pick their top six priorities among the SDGs, as they're known to international development wonks. Goal #14 fared the worst. Only 5.4 percent of the respondents included it in their top six priorities, compared to 65.2 percent for quality education or 60 percent for decent work and economic growth. The respondents included elected politicians, bureaucrats, nonprofit and humanitarian executives, and business leaders from 126 low- and middle-income countries in South and Central America, Africa, Europe and Asia. Goal #14 ranked as the least important goal in all those professional sectors, and in every region except East Asia and the Pacific, where it came in third from the bottom. "Leaders are fairly consistent in emphasizing jobs, education and strong institutions as the most important development challenges," says Samantha Custer, AidData's director of policy analysis and the survey's lead author. "But they turn something of a deaf ear to climate change and other environmental goals." That's not just a shame for the whales, development and marine science experts say: It's a serious missed economic opportunity. A 2015 study from the World Wildlife Fund found that oceans provide at least $2.5 trillion in goods and services every year, from fisheries to shipping to tourism. If the oceans were a country, they'd have the world's seventh-biggest economy, just ahead of Brazil. Tapping that resource, and making sure it's protected, should be a higher priority for developing countries, says Brad Ack, WWF's senior vice president for oceans. "Oceans are a critical foundation for developing economies," he says. "People aren't drawing the connection between things they take for granted and the role oceans play in providing those services." The survey results weren't necessarily surprising, Custer says. Last year, she conducted an analysis of development funding — how much money the U.S. government, World Bank and other major donors were spending on projects under each of the goals. Climate and environmental initiatives received significantly less funding than most other categories. Between 2000 and 2013, she found, the three goals that deal explicitly with climate and the environment together received $23.78 billion — just seven percent of what Goal #16, which deals with peace and justice, received. Those numbers say a lot about the way rich countries and institutions prioritize challenges in developing countries. But Custer wondered if the countries giving aid might be out of step with the countries receiving it. On the contrary, she says, the new survey indicates that to a large extent they are on the same page, and that "everybody has a blind spot when it comes to the environment, apparently." The reason, says Custer, may be that for the poorest countries, conservation still seems like a luxury that leaders can't afford when their people lack essentials like a regular supply of nutritious food and clean water. 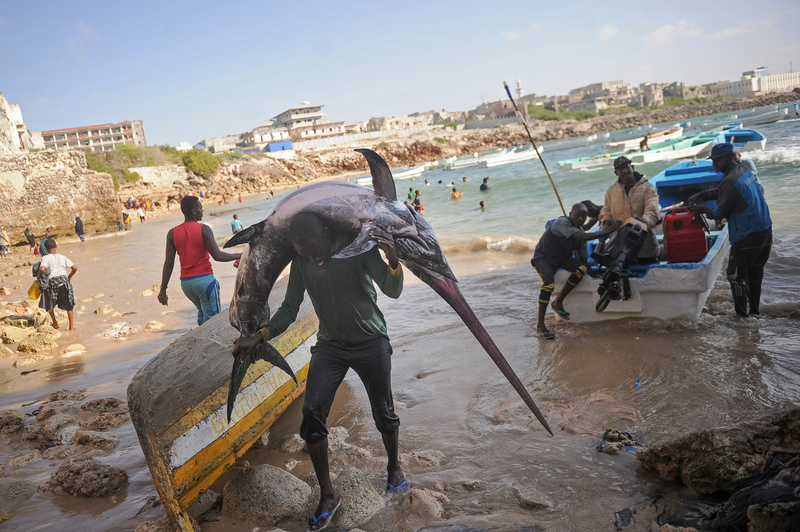 Marine conservation, in particular, is a complex, global issue that leaders may find difficult to wrap their heads around, says Najih Lazar, a fisheries researcher at the University of Rhode Island and former U.S. Agency for International Development official in West Africa. In fact, Lazar says, when the SDGs were being developed, marine conservation was almost axed as an independent goal and rolled into a more general umbrella environmental goal. It took persistent lobbying from marine and development experts on the potential economic and development benefits oceans can provide to convince the U.N. that the ocean was worthy of its own goal. What, Really, Does 'Sustainable' Mean? "It's not easy to convince a lot of people," he says. "Underwater resources are not visible, and it's not easy to understand the value in terms of economic growth. Very few have jumped on that wagon." For that reason, he says, many developing countries leave a lot of the ocean's potential value — jobs and food — sitting on the table. But those who do make the connection stand to reap a big payoff, he says. As an example, he points to Morocco. In 2009 the country completely renovated its fishing regulations with an eye toward conservation, cracking down on illegal fishing and implementing new measures to ensure that less seafood was wasted during processing. Since then, the country has seen employment in the fishery sector increase 30 percent and the value of its exports nearly double to $2 billion — while also seeing a revival in populations of threatened fish and octopus. Charles Kenny, a senior fellow at the Center for Global Development, says it's important to remember that although the goals seem separate, they in fact build off each other and that more could be done to help everyone involved with implementing them — including developing country leaders and officials in donor organizations — understand the links between them. "If you want to fix global hunger," he says, "we need to fix the oceans."